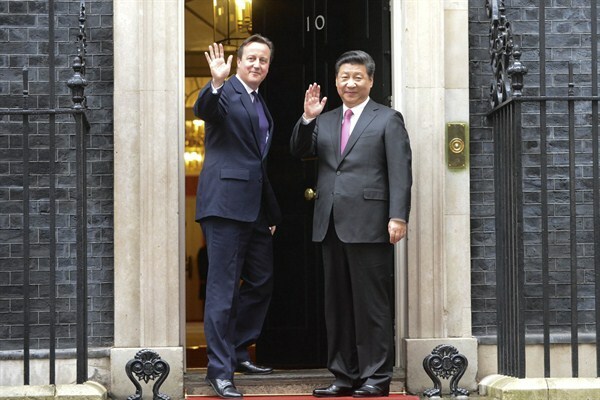 U.K. Prime Minister David Cameron welcomes Chinese President Xi Xinping, London, Oct. 21, 2015 (10 Downing St. photo by Georgina Coupe). Chinese President Xi Jinping’s visit to the United Kingdom this week has largely attracted the wrong kind of headlines. Reactions from experts and officials in the United States and across Europe have been scathing, ranging from the bemused to the disturbed. Many contend that Britain’s China policy, at the instigation of Chancellor of the Exchequer George Osborne, has been reduced solely to matters of commerce.